HENRY C. CARPENTER, who is highly esteemed and respected throughout the community where he lives, is an intelligent and progressive citizen who gives much thought to the questions of the day. He makes his home on section 18, Ridge Township, Shelby County. His father was Israel Carpenter, who was born in Lancaster, Pa., and his mother, Susan Hess, was probably born in Pennsylvania of German parentage, was also the father. The father died when about fifty-two years old, the mother at the age of ninety-one years. 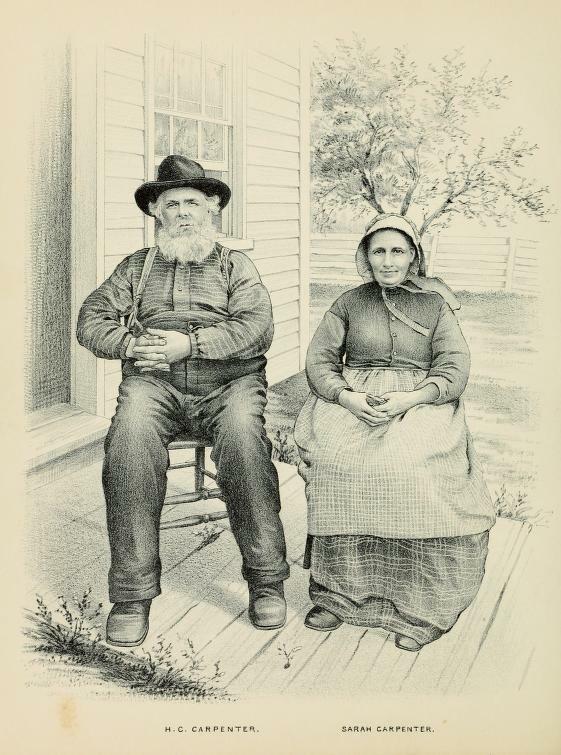 The parents of our subject came to Shelby County, Ill., from Delaware County, Ohio, about 1837, and settled in Shelbyville, where they resided for a few months. Later they removed to a point north of Shelbyville near the fair grounds and then made their home in Okaw Township, where the father passed from earth. His widow died at the residence of our subject in Ridge Township some years later. They had eleven children, of whom our subject is the fifth in order of age. Henry C. Carpenter was born in Delaware County, Ohio, October 1, 1825, and hence was about twelve years old when he came to Shelby County, Ill., with his parents. Here he grew to manhood and spent most of his early life with the exception of four years which he passed in Sangamon County. He was reared upon the farm and has made agricultural pursuits his chief business in life. The marriage of Mr. Carpenter in Ridge Township, September 30, 1852, brought him as a wife Miss Sarah Downs, daughter of Electious and Mary Ann (Stiffler) Downs. For particulars in regard to the history of this prominent family the reader is referred to the life sketch of J. H. Downs which appears on another page of this volume. Mrs. Carpenter was the fourth in a family of eight children, and first saw the light December 28, 1831, in Washington County, Md. She came to Shelby County, Ill., with her parents in 1845, and here grew to a beautiful and vigorous young womanhood in Ridge Township. Mr. and Mrs. Carpenter are the parents of nine children namely: George W., who married Mary F. McDonald and died at the age of twenty-two; Electious who took to wife Clara Worthman; Willie who passed away in infancy; James W., who married Sarah M. Jones; Sarah Ann the wife of O. J. Engle; John Alonzo who took to wife Ida Bruner; Ira W.; Mary Ellen, who died in infancy, and Nora J. Our subject filled efficiently and satisfactorily the office of Supervisor of Ridge Township for two terms, and has also been Road Overseer and School Director. He formerly took an active part in political affairs but is independent in his party affiliations. He is liberal in his religious views and interested in all progressive ideas. His splendid tract of five hundred and seventeen acres, most of which is located in Ridge Township bears every sign of the hand of a thorough, systematic and industrious farm manager. The attention of the reader is invited to the lithographic portraits of Mr. and Mrs. Carpenter, which are presented elsewhere in this volume. Extracted 28 Feb 2017 by Norma Hass from 1891 Portrait and Biographical Record of Shelby and Moultrie Counties Illinois, pages 470-471.